If you’re a regular visitor to PrecisionAg.com – and we hope you are – you’re keenly aware that precision agriculture and digital farming are changing and evolving. So, too, is PrecisionAg.com. Coming soon will be an entirely new look and focus for our site. 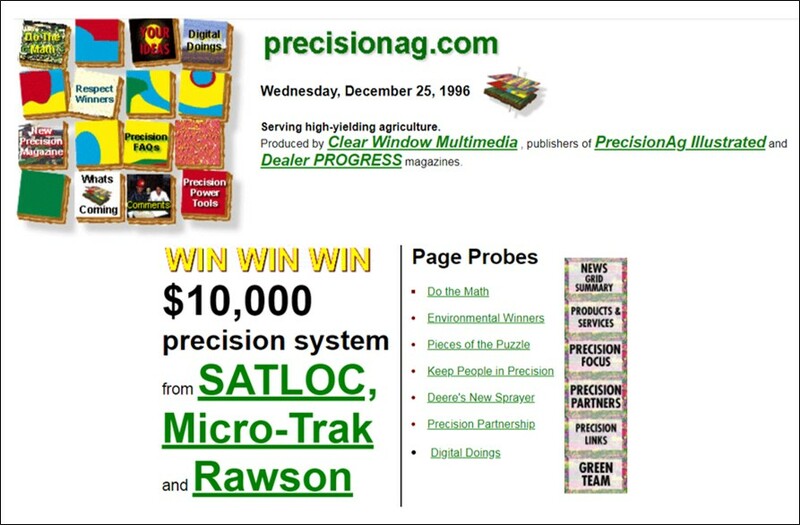 PrecisionAg.com as it looked on Christmas Day 1996, shortly after it launched. Meister Media Worldwide acquired the site and several related print publications several years later. Click for full view. 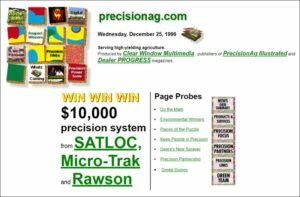 You may be interested to know PrecisionAg.com is a granddaddy by internet standards – launched all the way back in December 1996. Then the site was built largely for row crop farmers and ag retailers, mostly in the U.S., and predominantly in the American Midwest, where precision agriculture first took root primarily in the form of grid soil sampling, field mapping, and variable rate fertilizer application. But now the world has embraced precision agriculture in all its many modern forms, across nearly every practical application and in nearly every crop area imaginable. If you’re a technology-focused leader who is helping to drive agriculture forward, you’re just the reader we’re seeking. We think we have just the site and e-newsletter for you. Beginning soon, PrecisionAg.com will offer expert market analysis and commentary by a wide range of technology leaders from around the world, side by side with our professional market-facing editors and agricultural journalists representing the range of Meister Media Worldwide titles. We’re also launching a new weekly e-newsletter called The Signal to make it easy for you to keep up with what’s new and real in ag technology around the world. We’ll focus on longer-range trends and analysis. We’ll zero in on three major technology areas that are of the most acute importance to global professionals in production agriculture: In-Field Technologies, Digital Farming, and Farm to Fork. And we’ll also give you daily headlines culled from key precision regions and expertly curated by our editorial staff. At bottom, we’ll give you understanding and foresight, not just information and knowledge, to help you do your job better and build a new future for agriculture. So keep an eye out for the new PrecisionAg.com and for the opportunity to subscribe to a new companion e-newsletter that will bring the world of precision agriculture directly to you each week. It’s a new era for precision agriculture. It’s a new era for PrecisionAg.com. Stay tuned. And be sure to leave us your email so you don’t miss the relaunch of PrecisionAg.com and your first-edition of The Signal e-newsletter.